You can get hold of an Android smartphone for as low as Rs 1,999 but you will end up compromising on specifications and performance. Thanks to the comeback of Motorola and entrance of players such as Xiaomi, Gionee and even OnePlus, the consumer is in for a treat. Even if they don't get to lay their hands on the topend specs for Rs 10,000, thanks to the competition, they get the best specs and performance at this price. 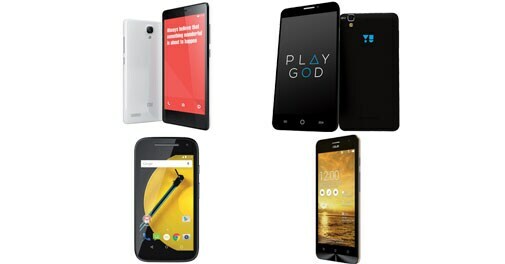 Divided into four categories, we tell you which are the best smartphones that will fit within your budget. A. UNDER Rs 10,000: Earlier called the mid-range segment, the increasing prices have pushed it to the low-end segment. But this doesn't mean you aren't getting any decent phones. Suddenly, everyone's focus has shifted to under Rs 10,000 price segment. The perfect example being Micromax and Cyanogen's new brand YU's first phone Yureka and Xiaomi's Redmi Note 4G. Xiaomi Note 4G (Rs 9,999): Xiaomi is a new name in India and has been in the news for all the wrong reasons (ban) lately. But the Xiaomi Note 4G is a good device. First and foremost, you are getting a big 5.5-inch screen with 720x1080 pixel resolution. Running on Android KitKat operating system, it packs in 1.6 GHz quad-core Qualcomm Snapdragon 400 CPU and is coupled with 2 GB RAM. This is a 4G-enabled smartphone and has got a 13 MP rear camera too. Motorola Moto E: Motorola has launched a new variant of the popular Moto E in India. Priced at Rs 6,999, it runs on Android Lollipop, has Qualcomm Snapdragon processor with a 1.2 GHz quadcore CPU and a 4.5inch display. We will review this smartphone in the April edition of Gadgets & Gizmos. YU Yureka (Rs 8,999): Competitively priced, the YU is Micromax's new brand powered with Cyanogen's software. With the sturdy hardware build, the Yureka has got a 5.5-inch IPS HD display, Cyanogen OS 11 (a custom aftermarket version of Android 4.4), a 13 MP camera, 64 bit Qualcomm Snapdragon 615 octa core chip with 1.5 GHz processor cores, Adreno 405 graphics and 2 GB DDR3 RAM. While all this looks promising on the paper, the performance too is impressive. Undoubtedly, one of the best smartphones under Rs 10,000 available today. Asus ZenFone 5 (Rs 7,999): Taiwanese brand Asus returned to the smartphone space in India after a long gap. Even then the ZenFone series received a great response due to its affordable pricing. The company has now launched the new variant of the ZenFone 5. It packs a dual-core Intel Atom Z2520 processor with Intel Hyper Threading Technology clocked at 1.2 GHz. It has got a five-inch display, 8 MP rear camera, 2 GB RAM and 8 GB of internal storage. B. Between Rs 10,000 and Rs 15,000: This is yet another hot segment when we talk about smartphones. It started with Motorola's Moto G 1st Generation last year and now we have its successor too. The likes of BlackBerry, Xiaomi, HTC, Sony, Nokia, etc., have their smartphones in this segment too. But we liked only a handful of them. BlackBerry Z3 (Rs 12,793): There aren't many people who buy BlackBerry smartphones these days, but the Z3 is a neat contender. 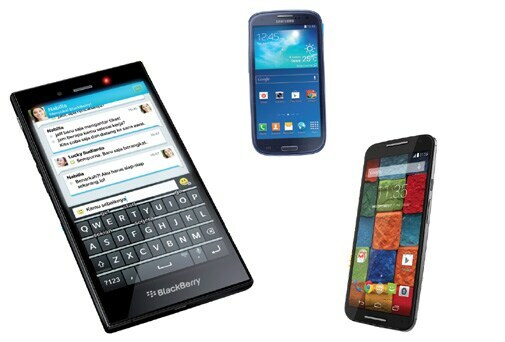 The BlackBerry Z3 has got a sturdy build and runs on the BB 10 OS optimized for all touch user interface. It features a five-inch LCD touch display, 1.2 GHz dual core Qualcomm processor, 1.5 GB RAM; 8 GB internal storage; 5 MP rear camera and 2500 mAh battery. It continues to fetch emails even before it lands in the inbox on the desktop. Samsung Galaxy S3 Neo (Rs 12,499): All Samsung smartphones look alike and this one isn't any different. The Neo 3 features a 4.8-inch touch display and has got a 1.2 GHz quad-core processor and 1.5 GB RAM. It is upgradable to Android KitKat and has got 8 MP rear camera and 1.9 MP front facing one. It has got 2100 mAh battery onboard and features like Smart Stay, Pop Up Play, etc. Motorola Moto G 2nd Generation (Rs 12,999): Coming from Motorola (now a Lenovo company), the Moto G 2nd Generation is the successor to the popular Moto G (1st generation). This one has got a five-inch HD display and is a dual SIM GSM smartphone. Powered by 1.2 GHz quad core processor based on Qualcomm's Snapdragon 400 chipset, it has got 1 GB RAM and 16 GB internal storage. It runs on Android KitKat and has got an 8 MP rear camera. What makes Moto G really smart are the small features such as Moto Migrate, Moto Alert, Moto Assist, etc. C. Between Rs 15,000 and Rs 20,000: This is one price segment where you get the best of both worlds - looks and performance. The names that we will mention might surprise you, but these are the best smartphones in this price category. Gionee S5.1 (Rs 18,999): If you want to hold an Apple look-alike in your hand, then the Gionee S5.1 is a perfect bet. This is a very sleek device having a 4.8 full HD display, a 1.7 GHz octa-core processor, 1 GB RAM, 16 GB internal storage and 8 MP rear camera packed in 5.15 mm sleek chassis. The phone has got stellar looks. The performance is decent and not meant for heavy graphic games and apps. Lenovo Vibe X2 (Rs 19,999): This smartphone is a surprise package and you will drool over the looks of this phone. The three layered design makes it look like a chocolate bar. The sleek design packs in an Android beast. 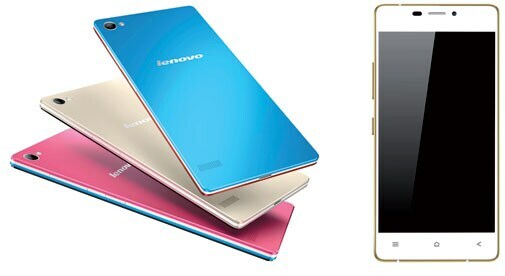 There is a five-inch touch display and Lenovo's customized user interface. It is powered by a 2 GHz Octa Core MediaTek processor and is paired with 2 GB RAM. There is also Android 4.4 onboard and the phone has got 32 GB internal storage. This is a dual SIM smartphone with one nano SIM and one micro SIM card slot. Xiaomi Mi 4 (Rs 18,999): The Xiaomi Mi 4 features a five-inch IPS display with 1920x1080 pixels resolution at 441 ppi. It has got a Corning Gorilla Glass 3 protection display. The smartphone runs on a 2.5 GHz quad-core Qualcomm Snapdragon 801 CPU and has got 3 GB RAM. It runs on Android 4.4.3 KitKat operating system and is loaded with the MIUI 6 user interface. Connectivity options onboard include 4G LTE, 3G, Wi-Fi and Bluetooth. The phone has got a 13 MP rear camera and an 8 MP front facing camera. It can also record 4k videos. It packs in a 3080 mAh battery. D. Between Rs 20,000 and Rs 25,000: Who says you need to spend 50 grand to get hold of a flagship device. 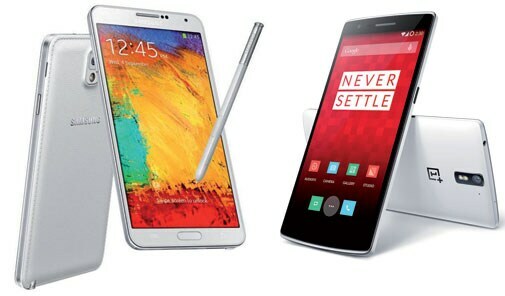 Companies like Motorola, OnePlus and even Google have launched some quality hardware during the last one year that stand tall against the flagships like Galaxy Note 5 and Xperia Z3. You might be compromising slightly on a specification or a processor, but you still get to hold a powerful beast in your hand. Here are a few. OnePlus One (Rs 21,999): It has a 5.5-inch full HD display; 13 MP camera; Cyanogen OS 10 on Android 4.4, 2.5 GHz quadcore processor on Qualcomm's Snapdragon 801 chipset; 3 GB RAM and above all 64 GB of internal storage. Well, while these specifications are good enough to tell how high-end specifications are loaded to the OnePlus One, it has got a great built as well. The sandstone finish at the rear makes it look premium. The performance and the freedom to customize fonts and permissions makes adds much more value and freedom to OnePlus One. Samsung Galaxy Note 3 Neo (Rs 22,120): If you are in love with Samsung's Galaxy Note series of phablets, but your pocket restrict you from buying one, consider the Note 3 Neo. Even this smartphone has got a 5.5-inch SUPER AMOLED capacitive touch display and S-Pen. It runs on slightly old, Android 4.3 operating system and has got Hexa Core ((1.7 GHz A15 Dual Core + 1.3 GHz A7 Quad Core) processor paired with 2GB of RAM. Of the 16 GB internal storage, 11 GB is user accessible. It is equipped with an 8 MP rear camera and a 2 MP front facing camera.